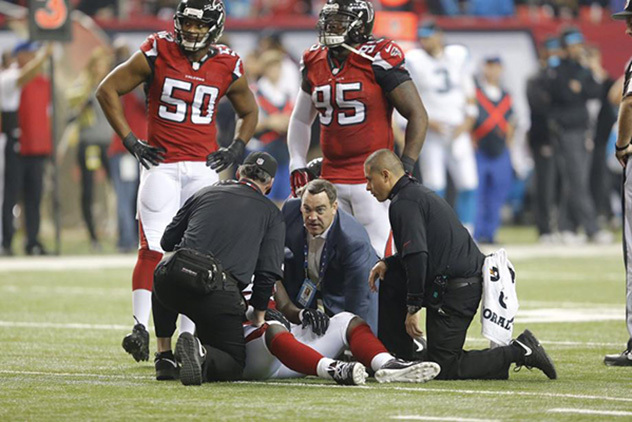 Dr. Karas has been named the Head Team Physician for the NFL’s Atlanta Falcons. He will serve as the team’s orthopedic surgeon, overseeing the orthopedic and medical care for the Falcons’ athletes and coaches. Dr. Karas began his duties February 24-27, at the NFL Invitational Combine in the Indianapolis Colts’ Lucas Oil Stadium, home of the 2012 Super Bowl. Dr. Karas is a member of the NFL Physicians Society. Dr. Karas’ previous professional sports team experience includes time with the Denver Broncos and Colorado Rockies training camps and through the NFL Invitational Combine. He has also served as head team physician or consulting team physician for the University of North Carolina, Georgia Tech, and Emory University athletic programs. A former collegiate athlete himself, Dr. Karas was a varsity letterman in wrestling at the University of Notre Dame.